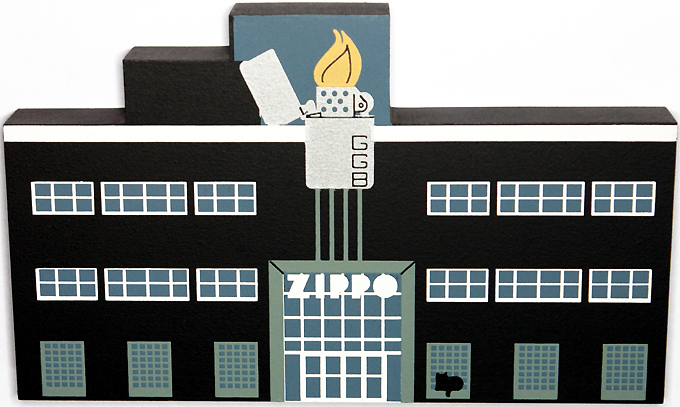 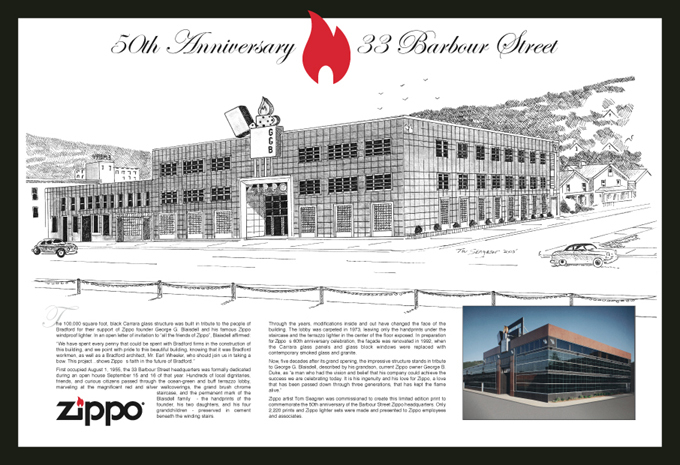 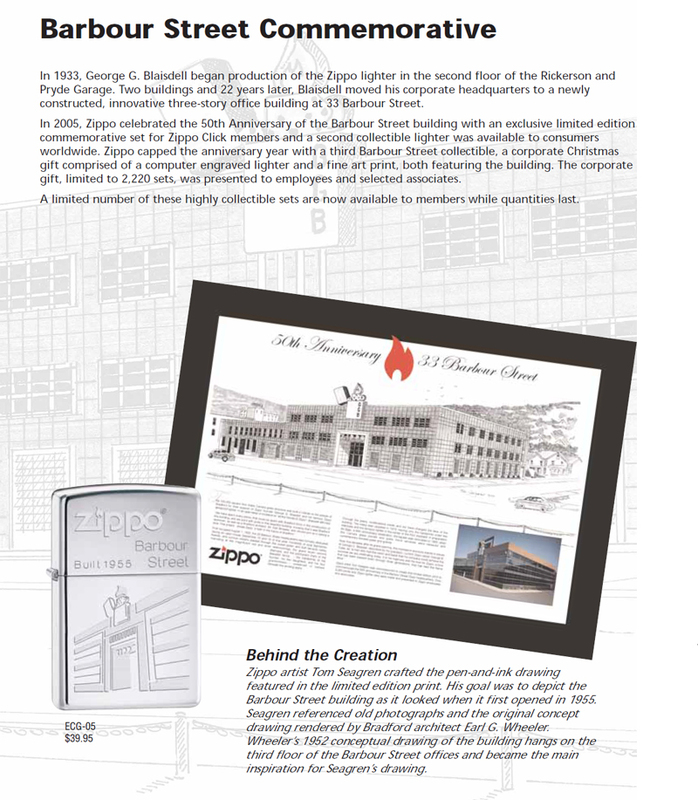 When thinking about Zippo's Headquarters everybody automatically has a picture in mind, the famous office building on 33 Barbour Street. 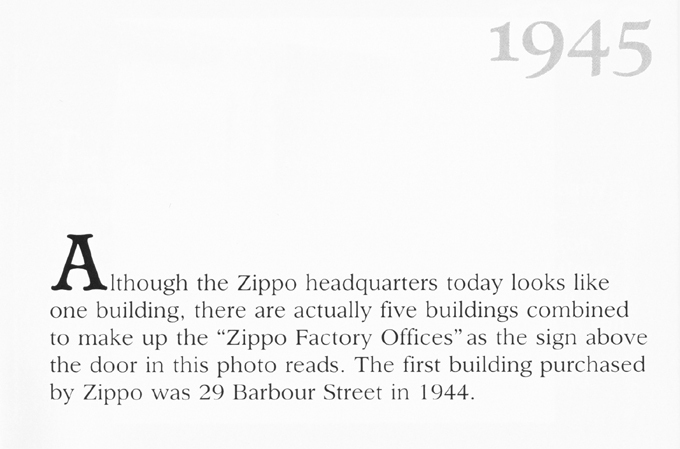 In fact the story of Zippo & Barbour Street goes back more than seventeen years before this building was finally completed in 1955. 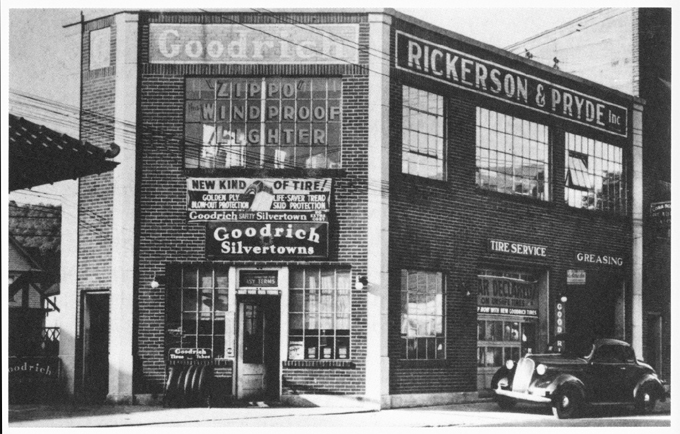 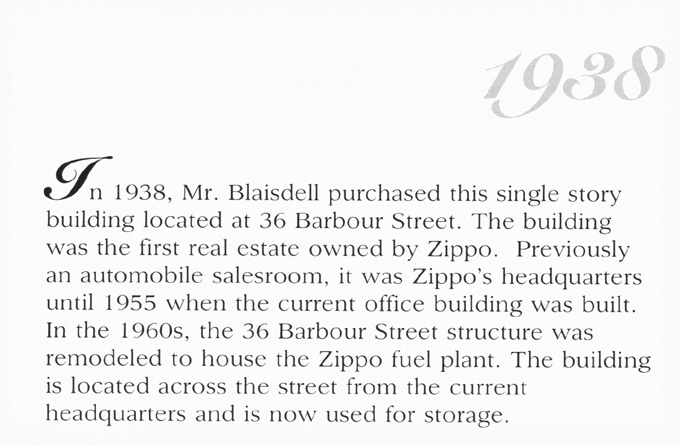 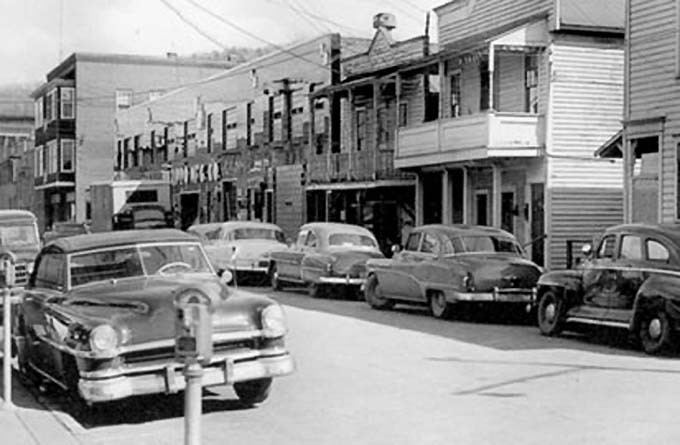 On March 27, 1938 George Grant Blaisdell purchased the first building on Barbour St., Bradford, Pa.
36 Barbour Street, previously an automobile salesroom, was Zippo's headquarters until 1955, with the office being locatated in the front & the factory in the back of the building. 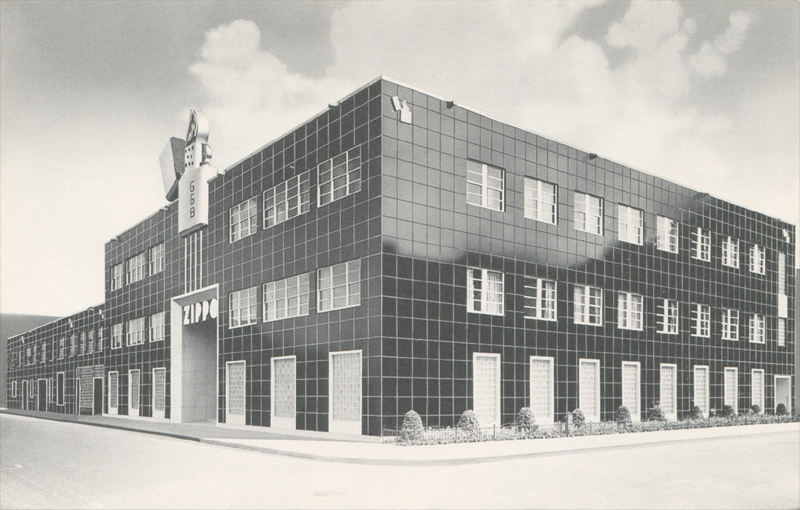 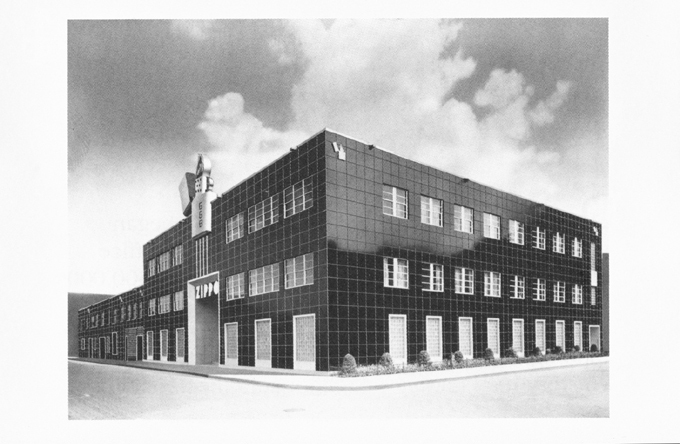 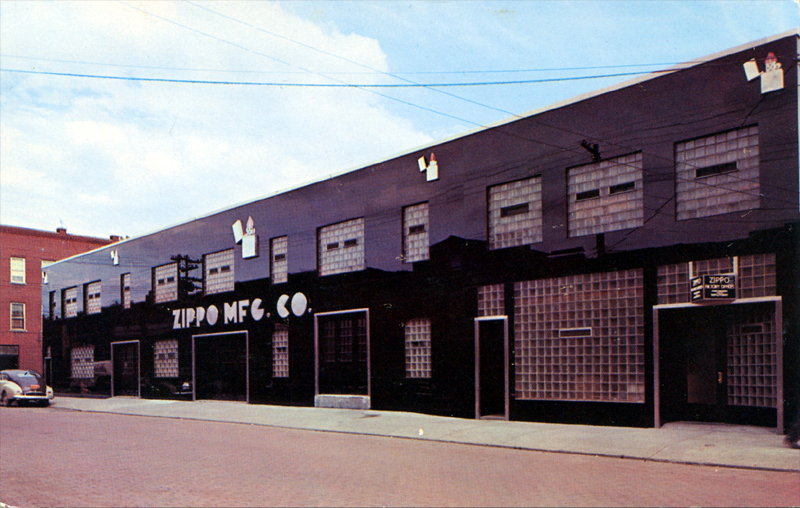 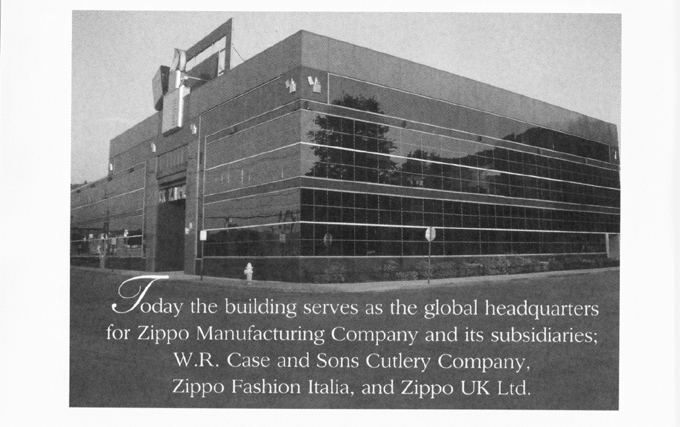 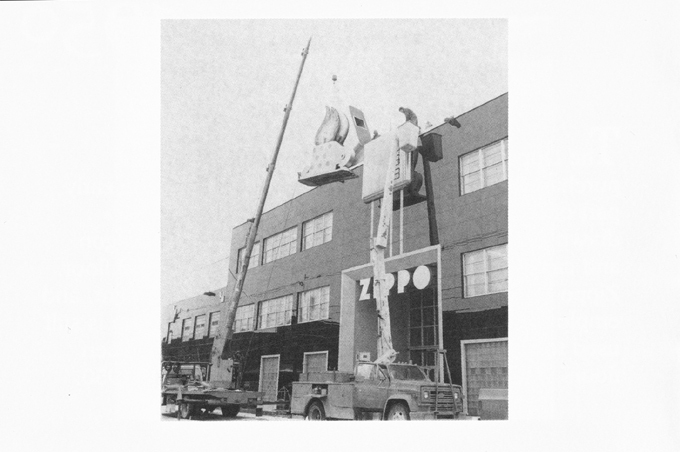 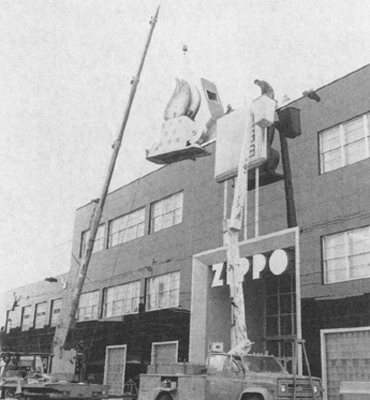 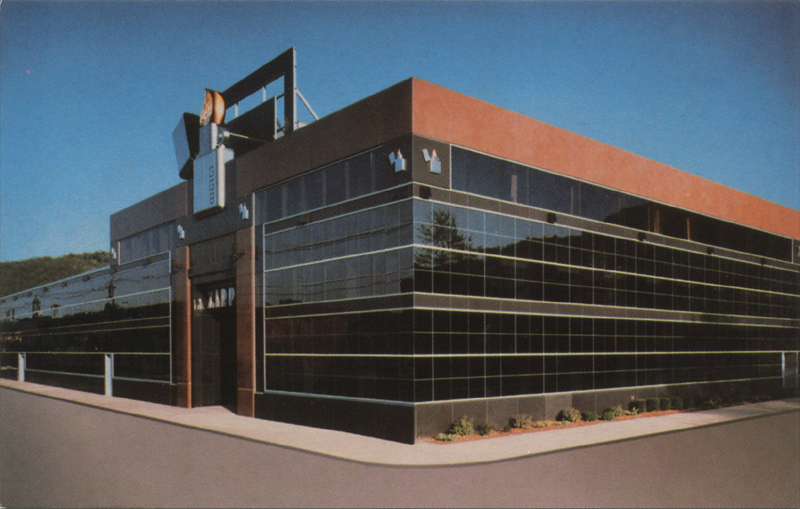 In the early 1960's, after the new headquarter was finally completed right across the street, this building housed the new Zippo lighter fuel company. 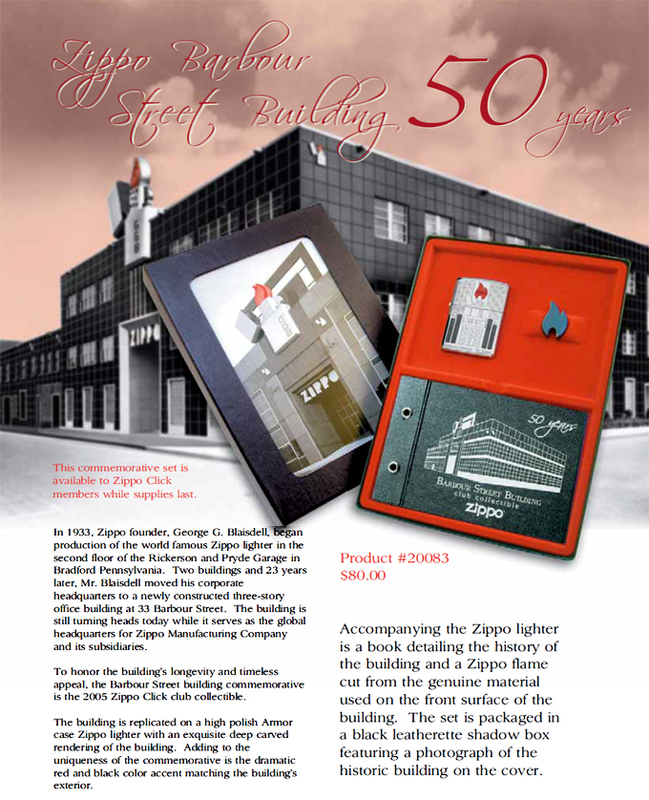 Since 1966 when the new Zippo fuel plant was completed on Congress Street the former headquarter was & still is used for storage today. 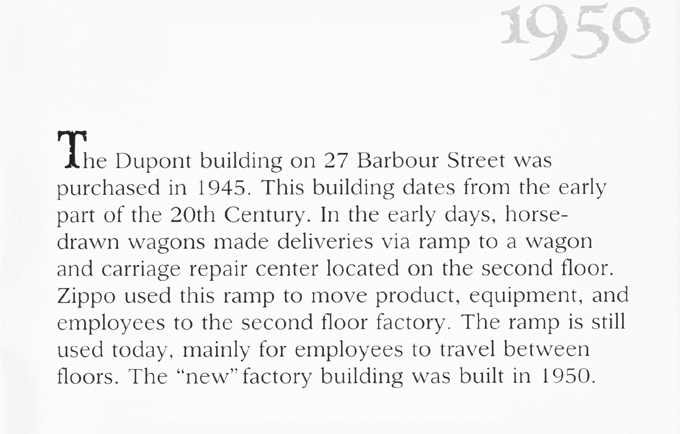 29 Barbour Street was purchased in 1944, one year later the Dupont building, 27 Barbour Street was purchased. 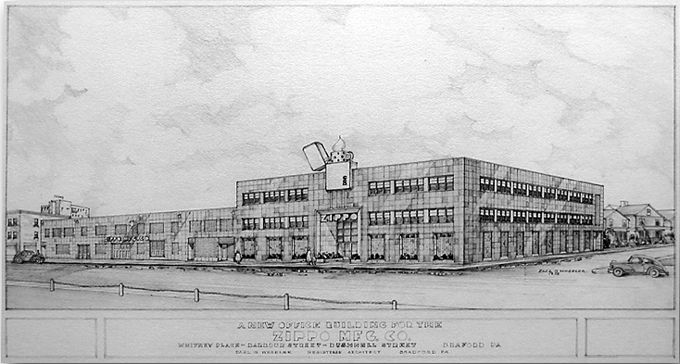 Until 1950 three more buildings were purchased to complete the new factory building. 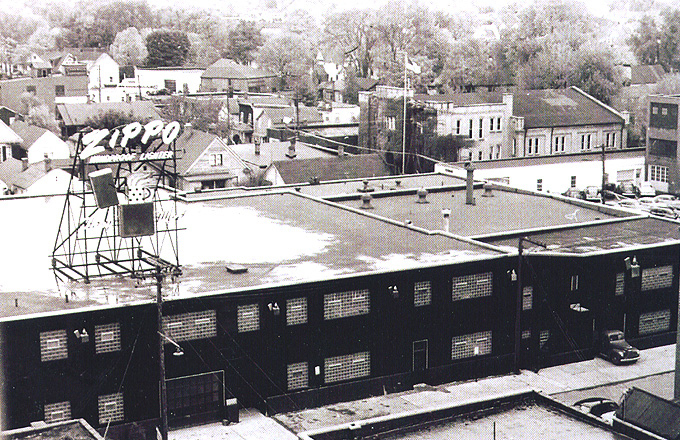 The famous giant neon sign on top of the Barbour Street office building was created by Bruce Ganoung, of Ganoung & Sons Sign Company out of nearby Olean, New York, in the early 1950s. 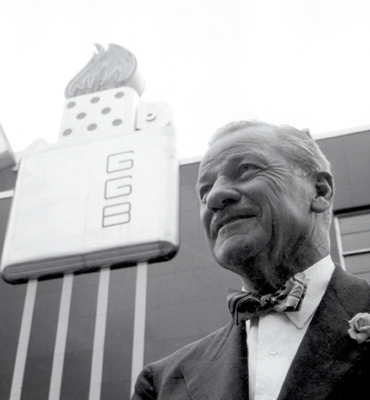 On December 24, 1952 George G. Blaisdell announced plans to construct a three-story-building on Barbour Street. 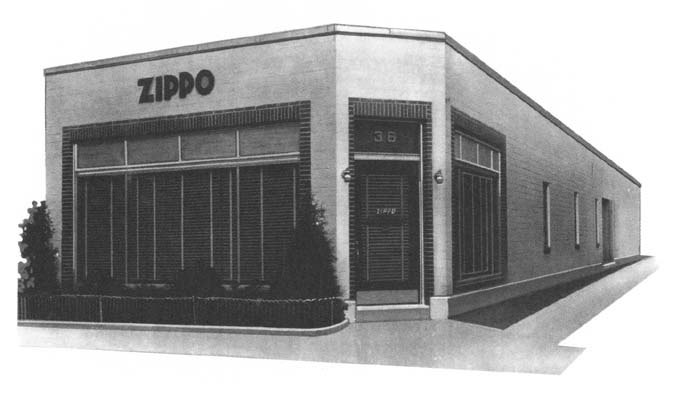 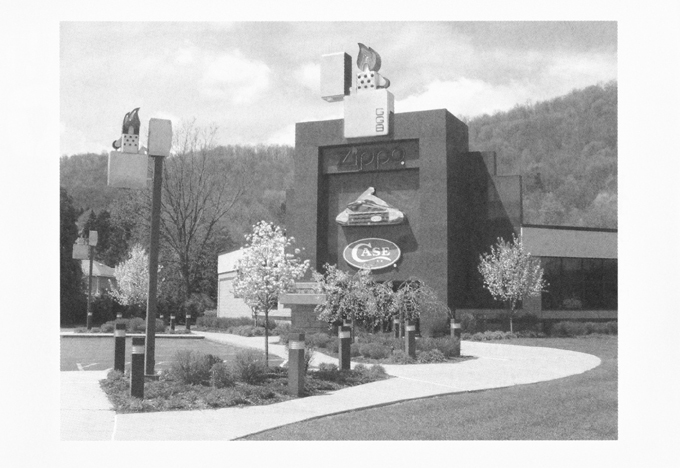 The rendering from 1952 by architect Earl G. Wheeler of Bradford shows the proposed building for Zippo Headquarters. 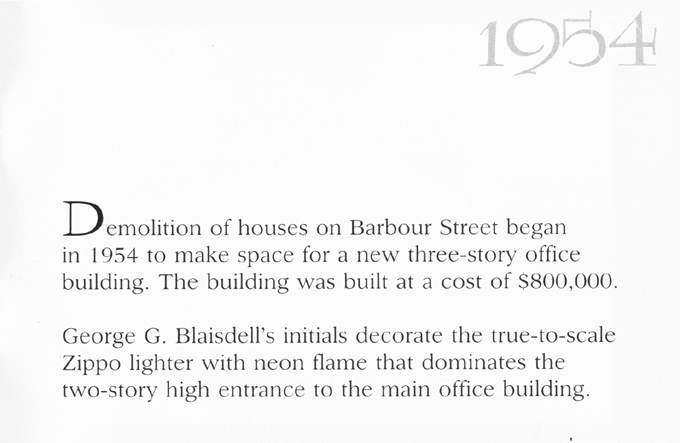 Finally in 1954 demolition of houses began to make space for the new building, which was built at a cost of US $800.000. 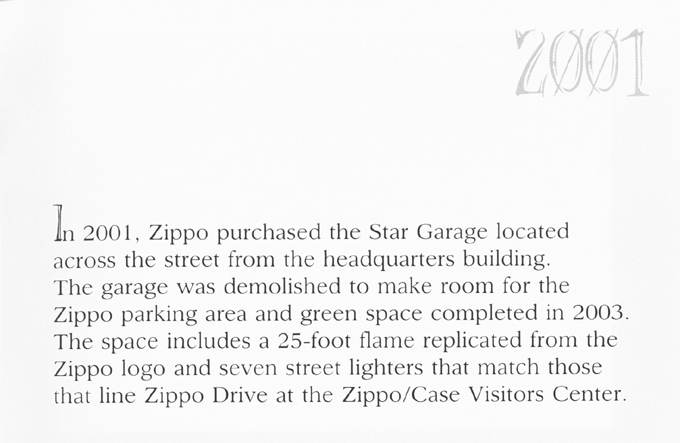 On August 1, 1955 the construction was completed. 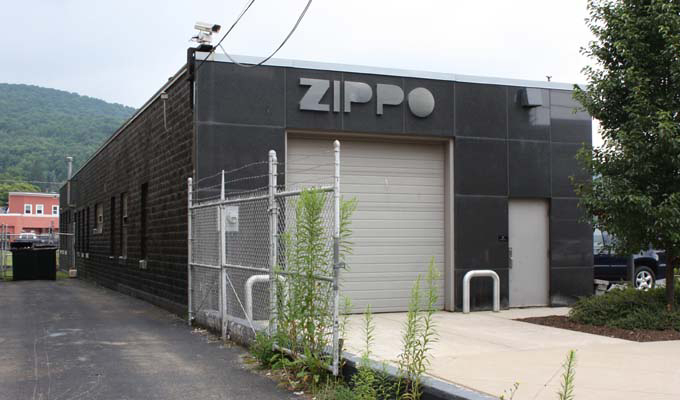 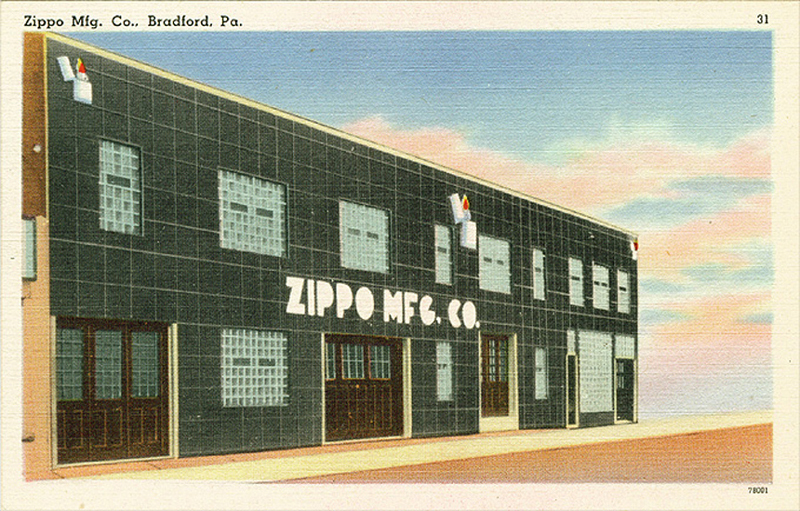 Bradford craftsmen played a mayor role in the construction of the new Zippo office building. 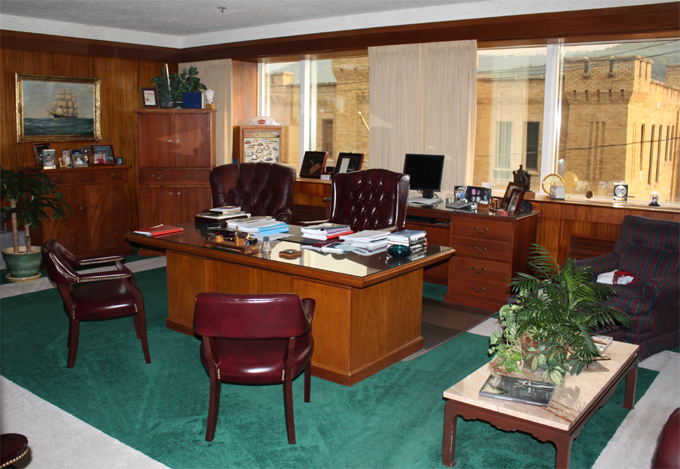 Mr. Blaisdell requested that, whenever possible, contracts to be awarded to Bradford firms. 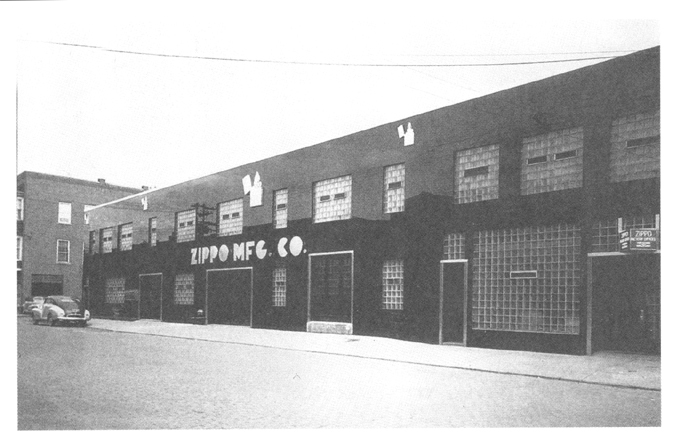 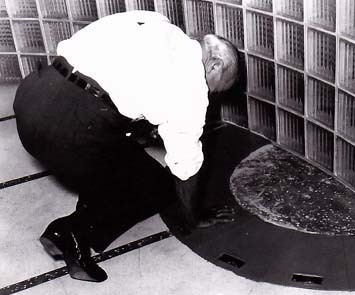 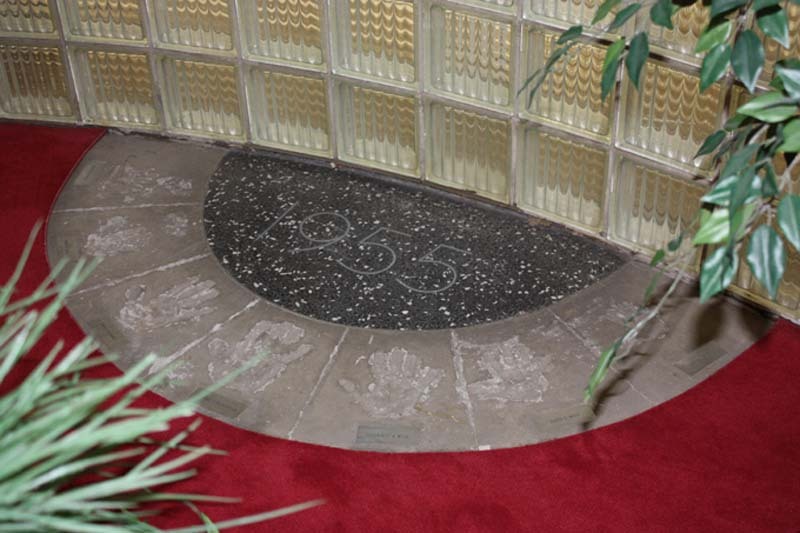 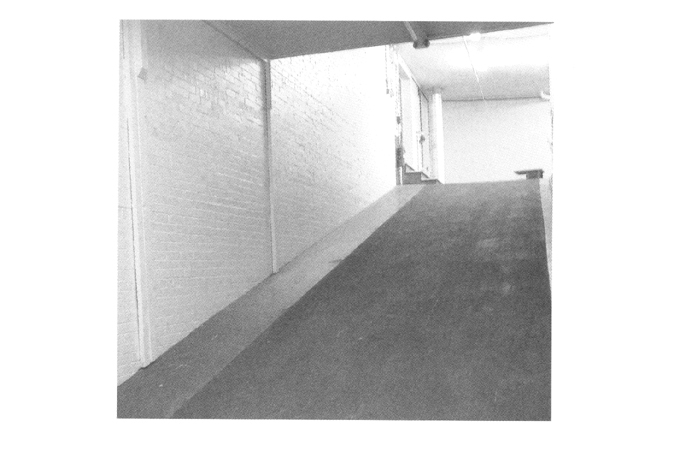 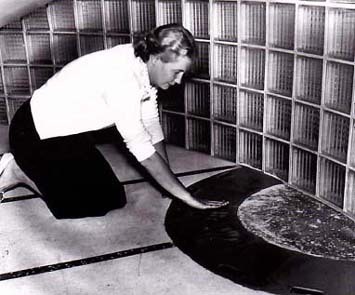 Among these were Tuna Manufacturing Co., Hull Electric, Inc., Monago's Floor & Wall Covering & many more. 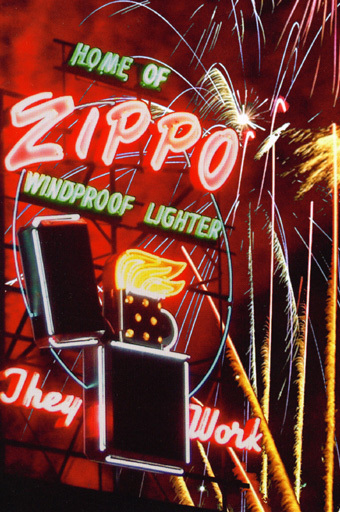 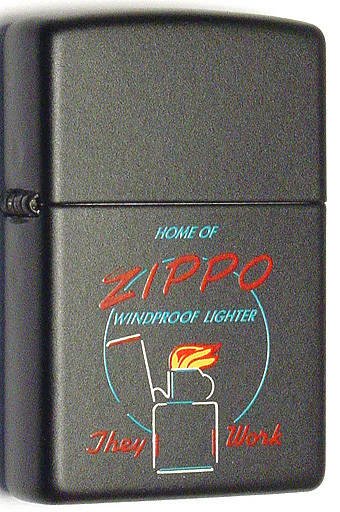 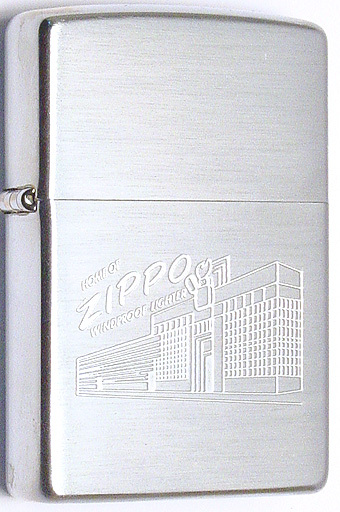 A true-to-scale Zippo lighter with neon flame dominates the two-story high entrance. 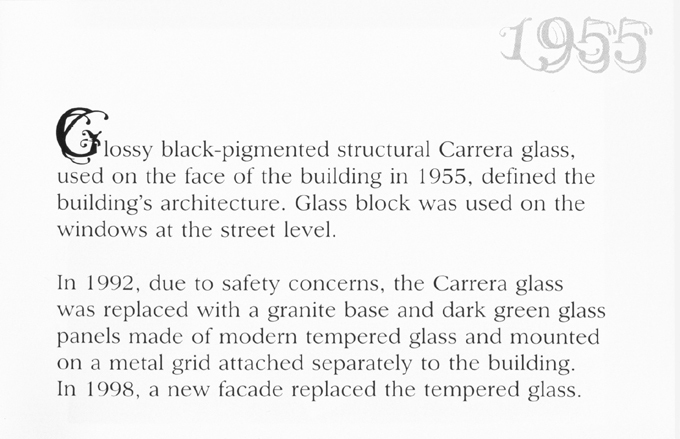 The face of the building was completely covered with glossy black-pigmented structural Carrera glass & glass block was used on the windows at the street level. 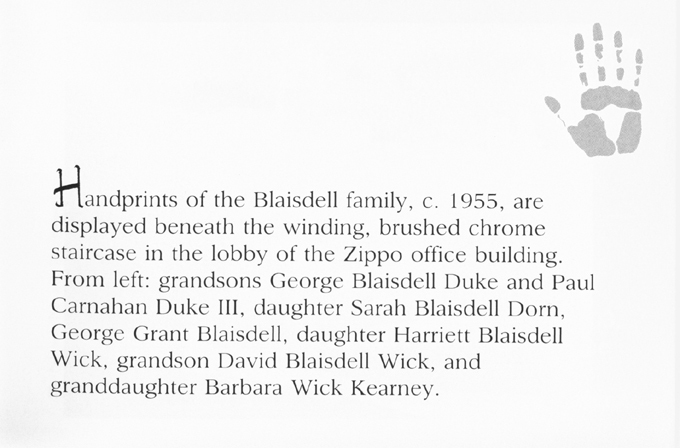 grandsons George Blaisdell Duke & Paul Carnahan Duke III, daughter Sarah Blaisdell Dorn, George G. Blaisdell, daughter Harriet Blaisdell Wick, grandson David Blaisdell Wick & granddaughter Barbara Wick Kearney. 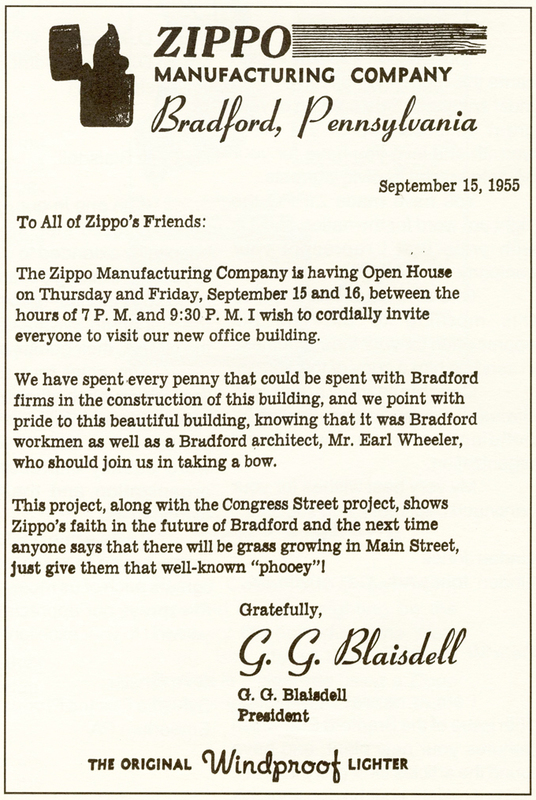 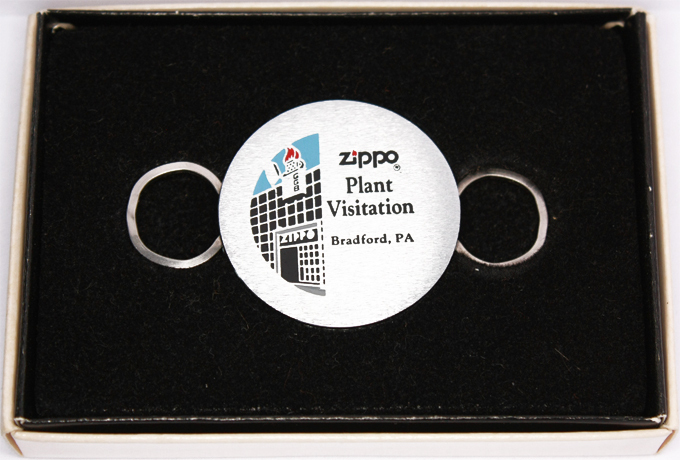 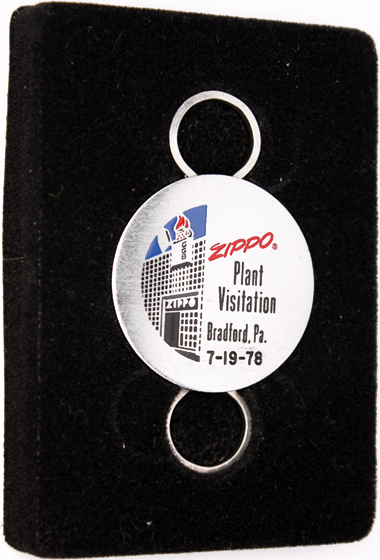 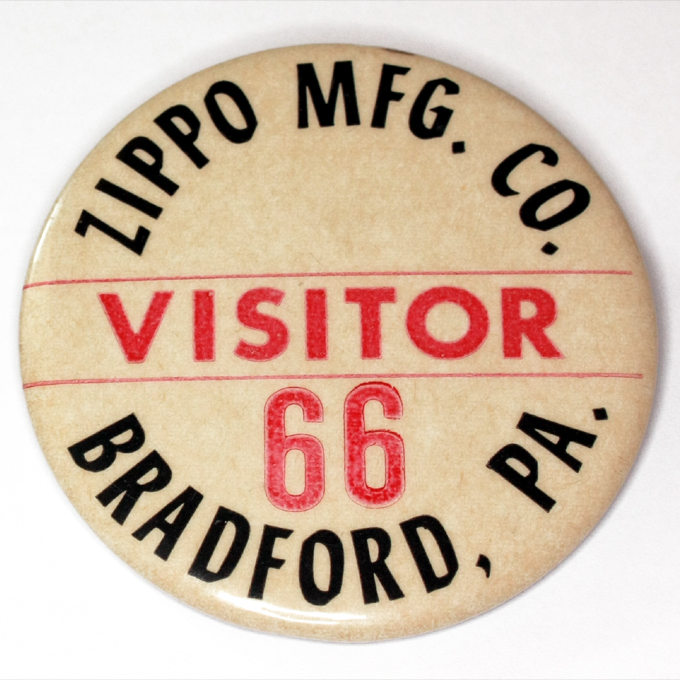 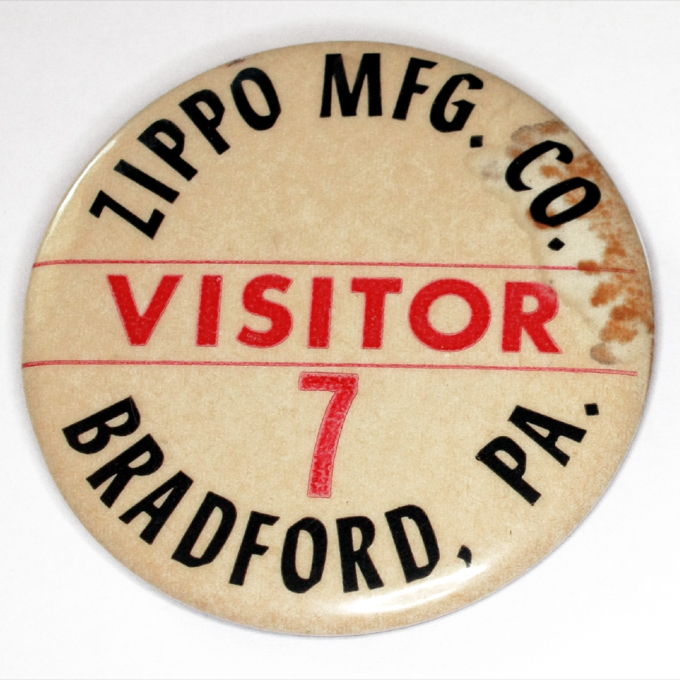 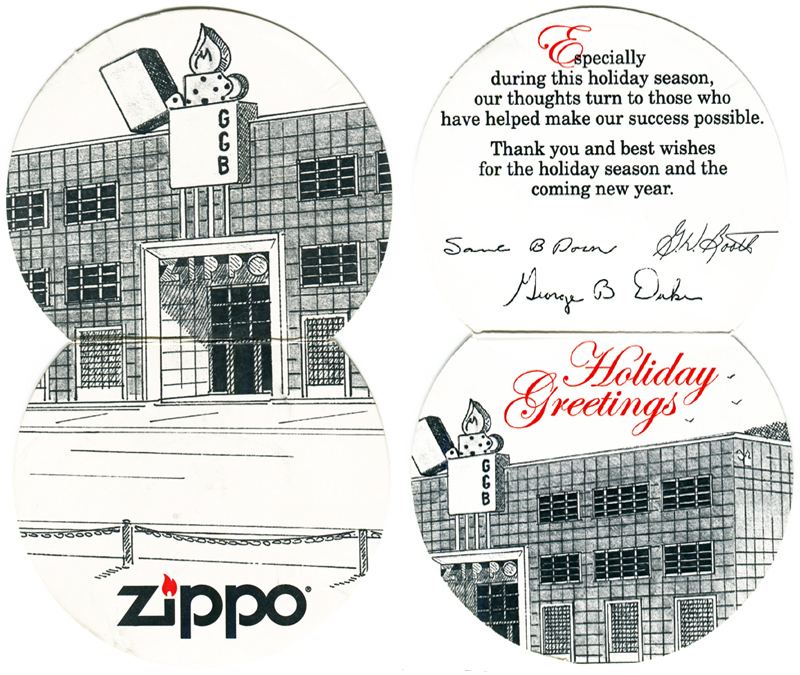 On September 15 & 16, 1955 George G. Blaisdell held and Open House - the first public plant visitation ever - to welcome Bradford residents & businessmen at the new Zippo office building. 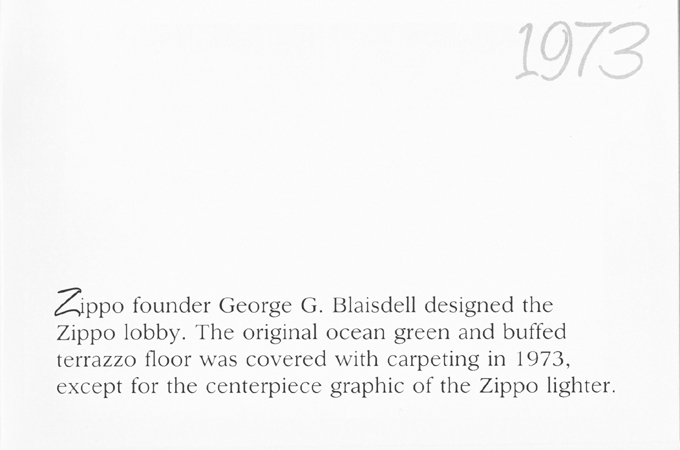 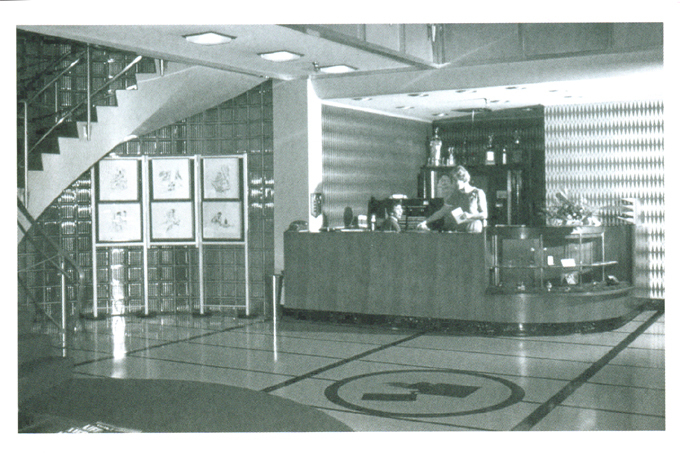 Guests admired Mr. Blaisdell's office in the top right corner, which still looks very much like this today, now occupied by Gregory W. Booth, Zippo president & chief executive officer. 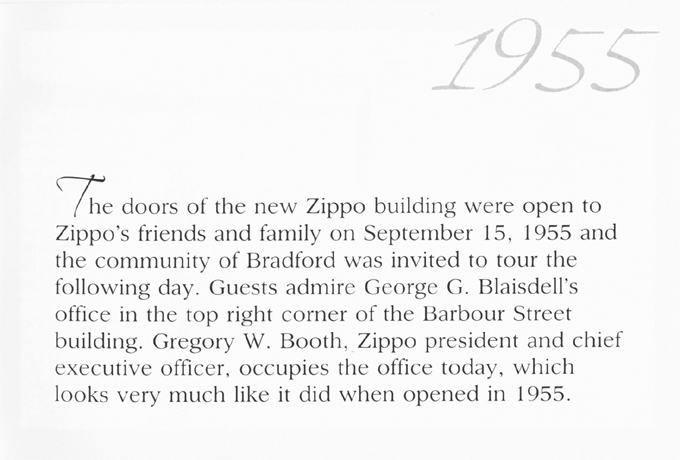 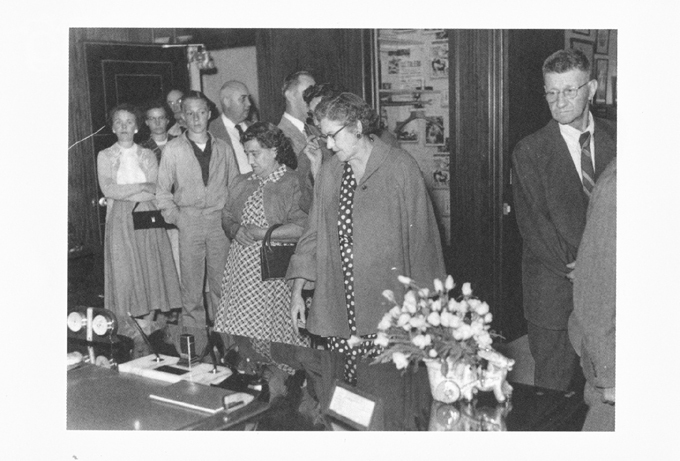 The very first plant visitation on September 15 & 16, 1955 held for the grand opening of the new Barbour Street office building was a big success & Mr. Blaisdell decided to offer plant visitations for small groups & businessmen ever since. 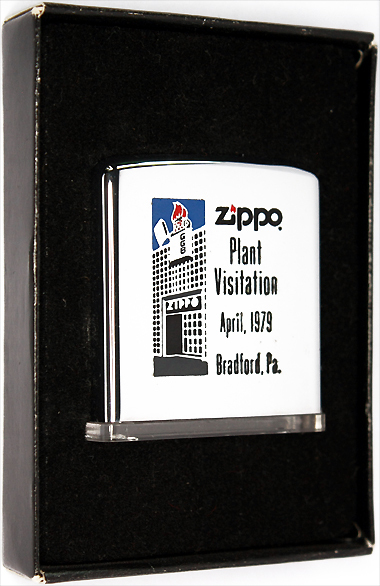 Visitors had to sign the guest book at the lobby desk, were given a visitor's badge & after their conducted tour received a Zippo lighter or other Zippo metal product, sometimes having their facsimile signature engraved & color-filled on the back of it. 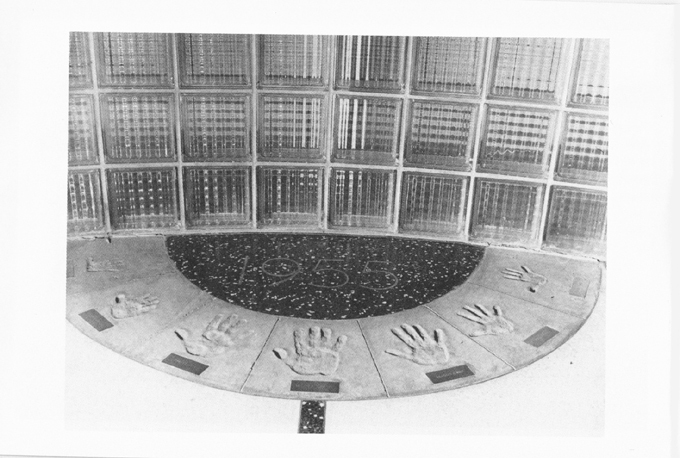 On September 5, 1991 reconstruction of the face began due to safety concerns & was accomplished early 1992.
base & dark green glass panels made of modern tempered glass. 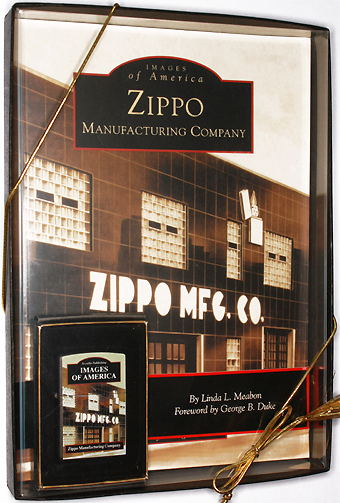 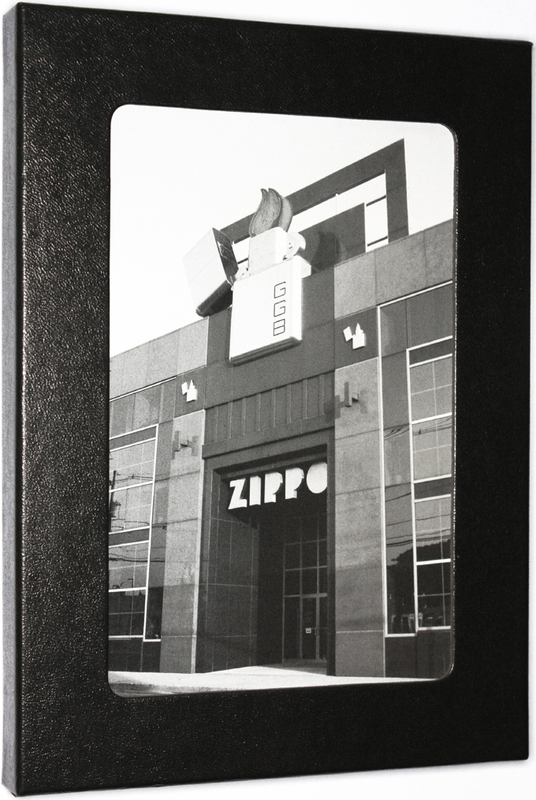 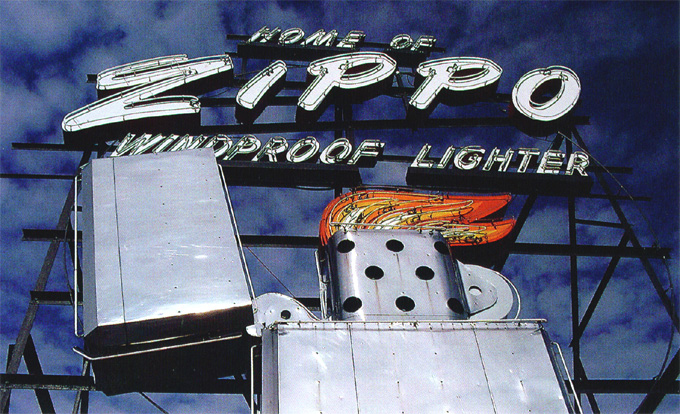 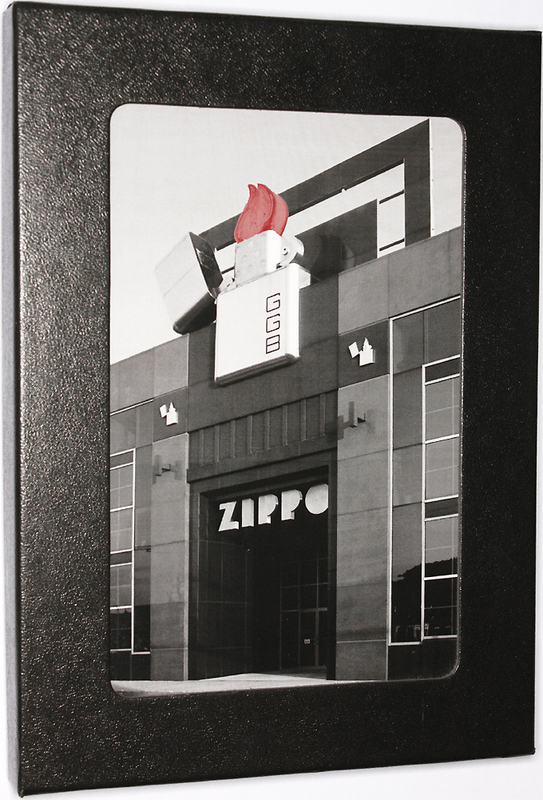 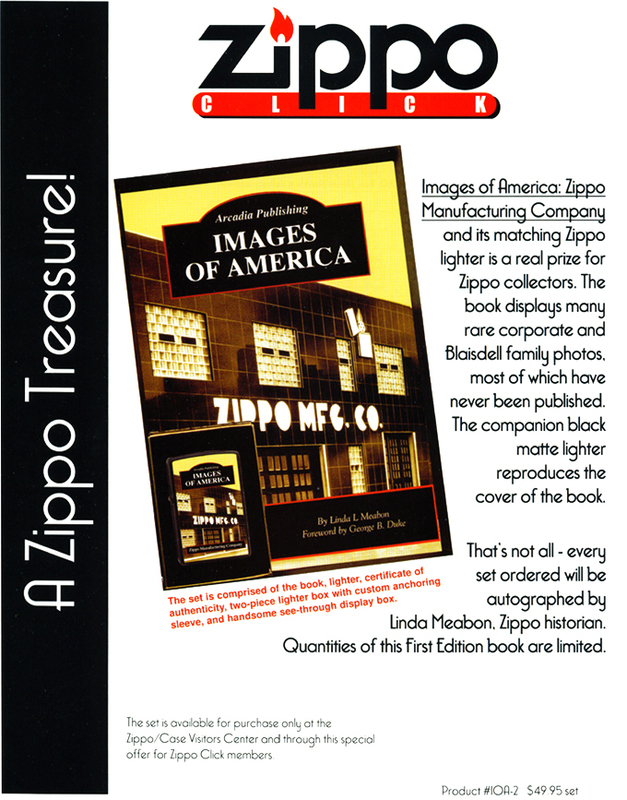 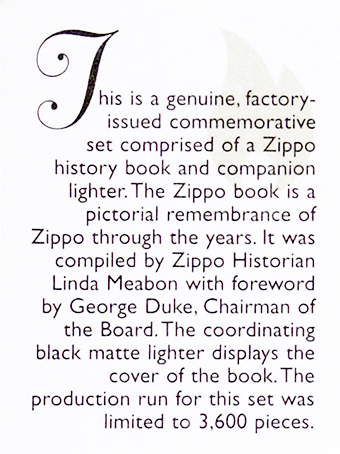 Linda Meabon, Zippo historian, compiled this 128-page book with the foreword by Zippo owner George Duke, grandson of Zippo founder George Blaisdell and more than 200 photos culled from the scrapbooks and photo files of the Zippo archives. 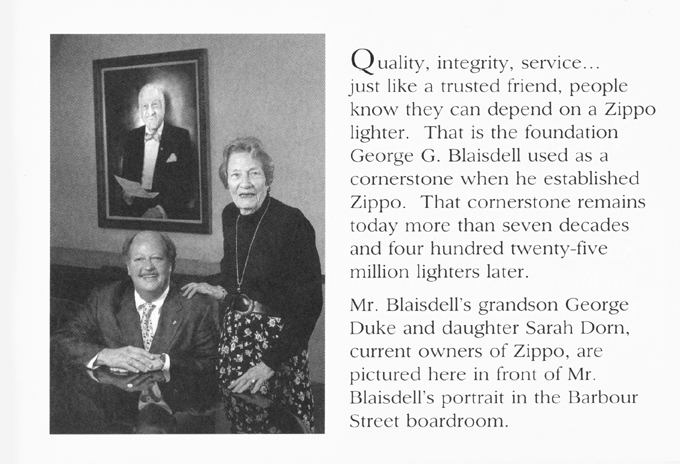 The book displays many rare corporate and Blaisdell family photos, most of which have never been published. 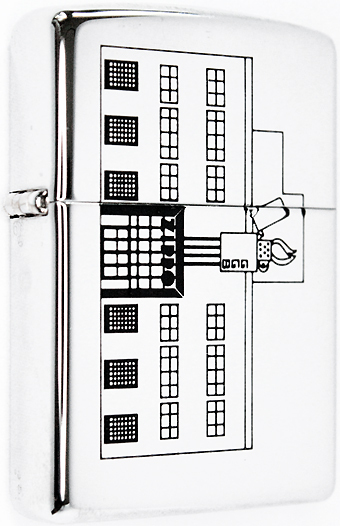 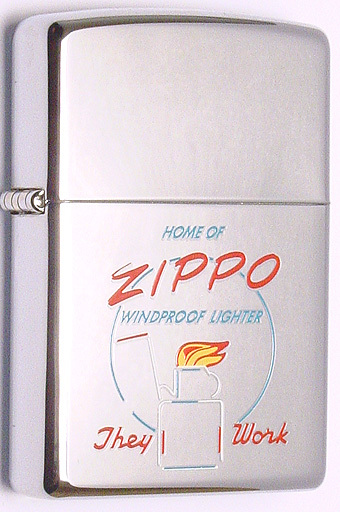 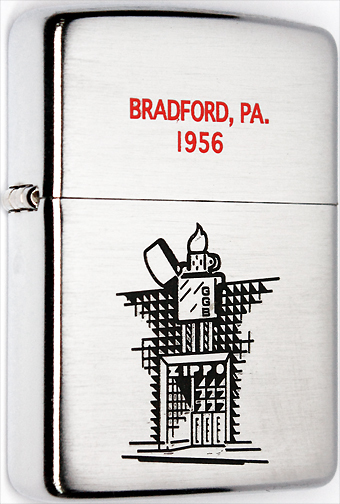 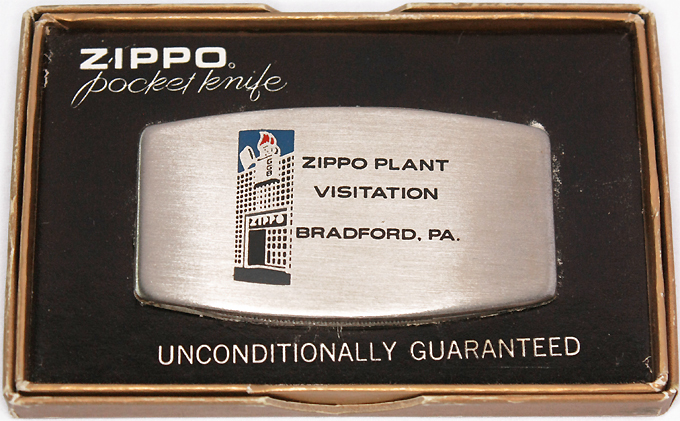 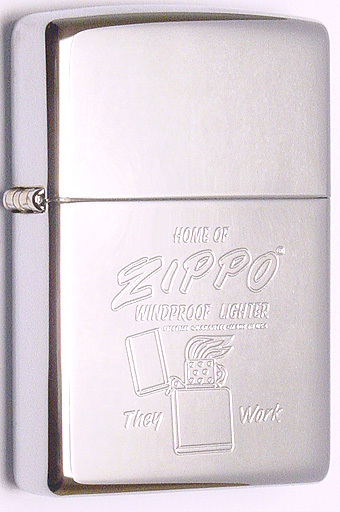 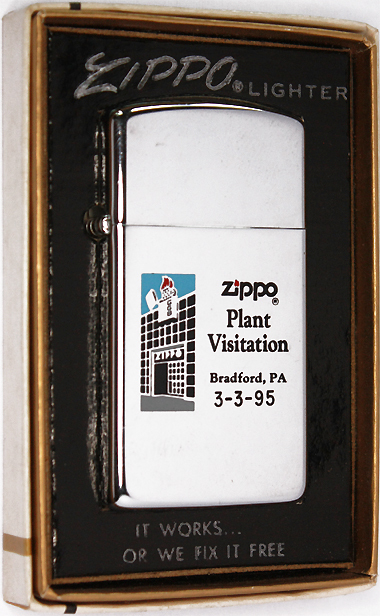 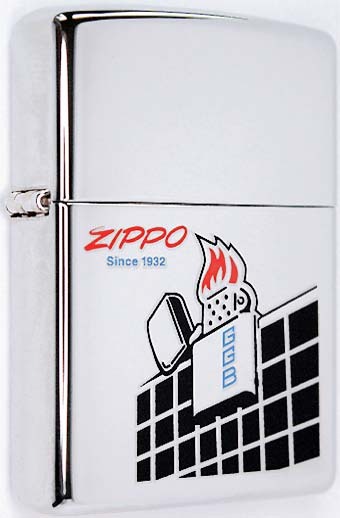 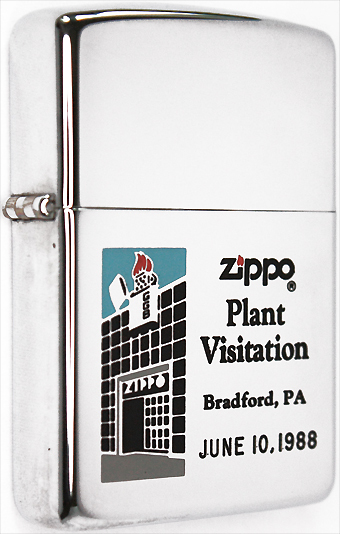 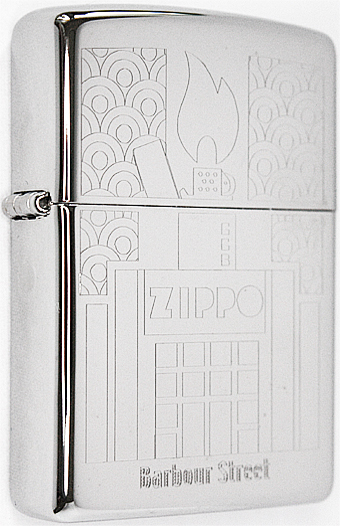 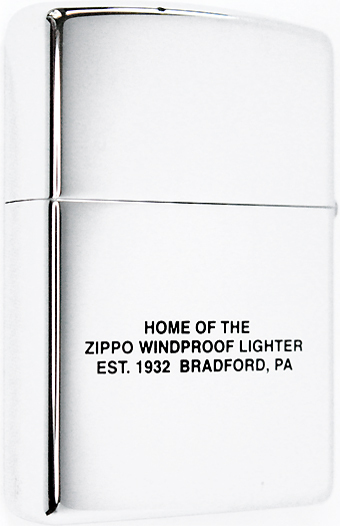 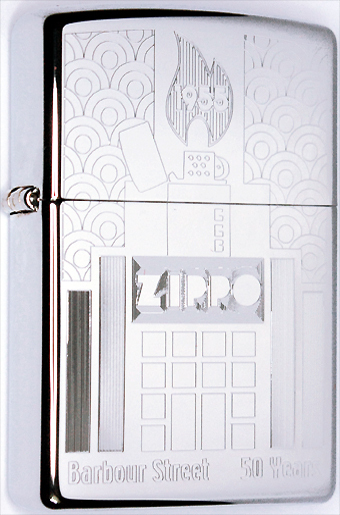 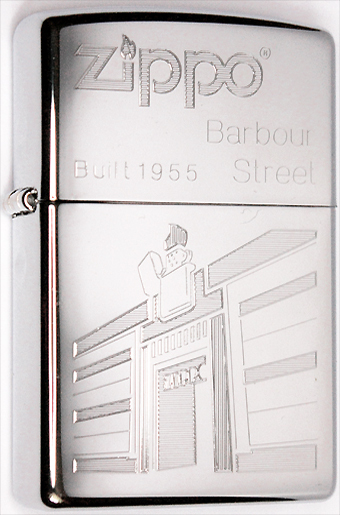 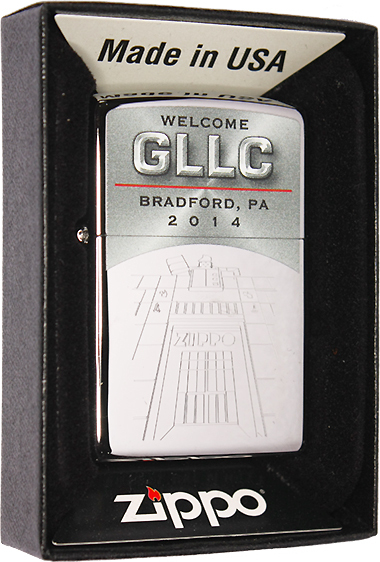 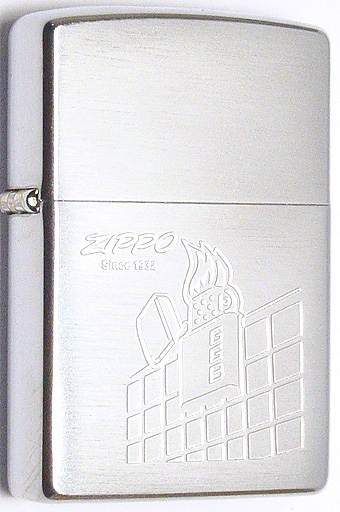 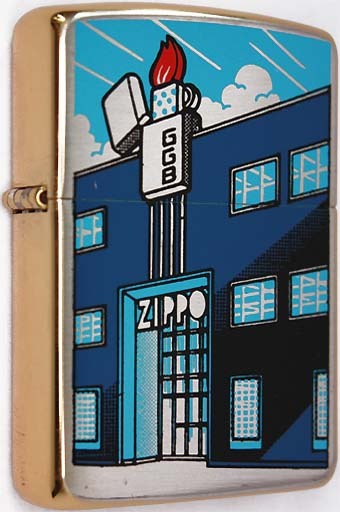 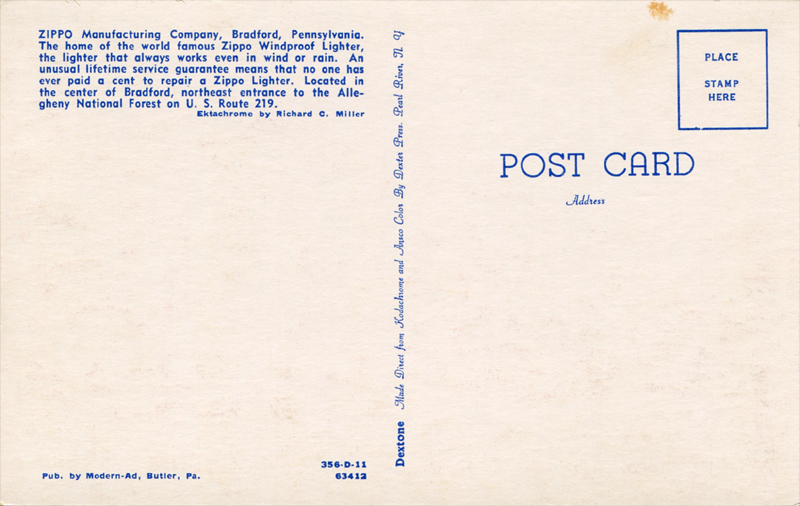 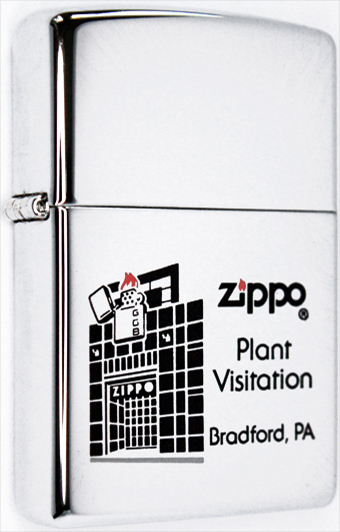 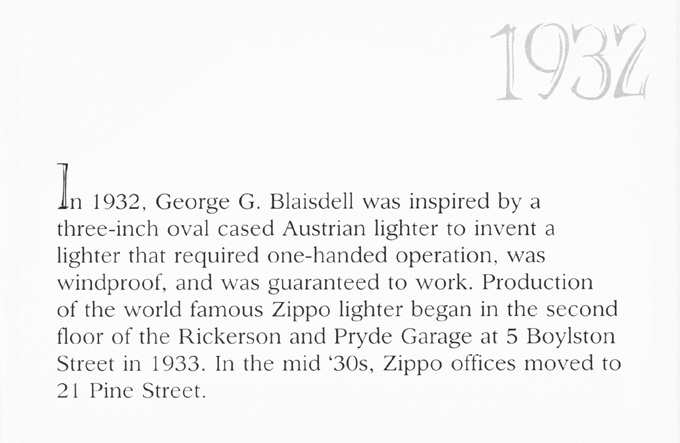 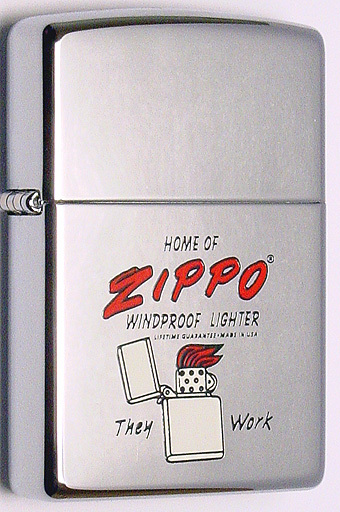 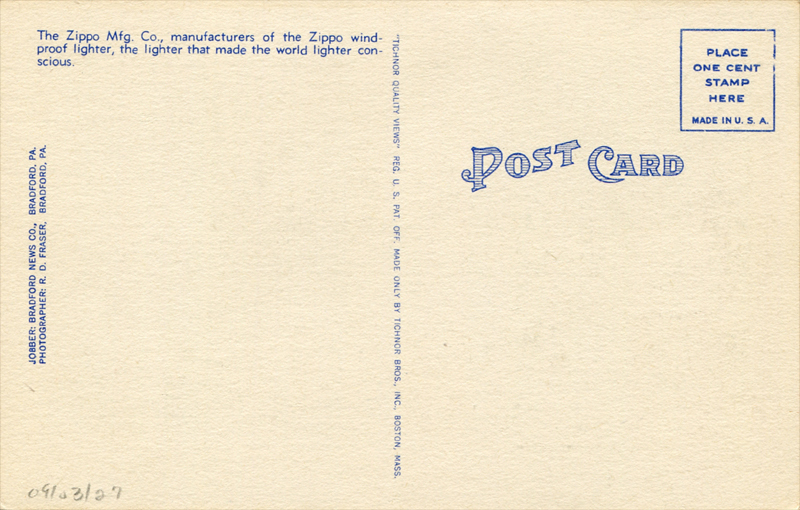 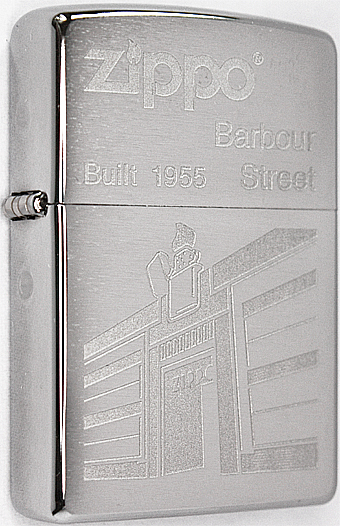 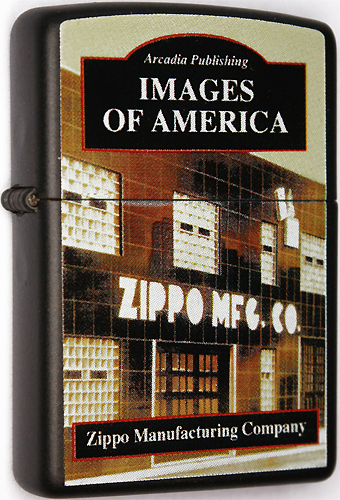 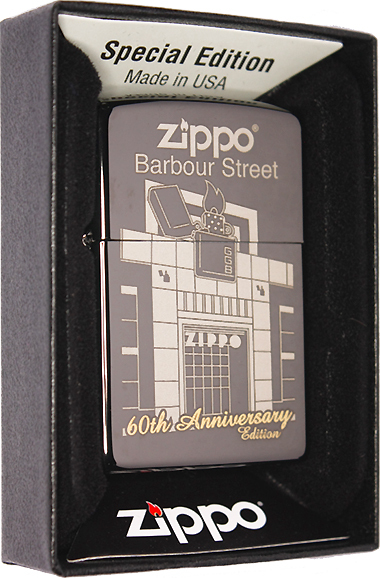 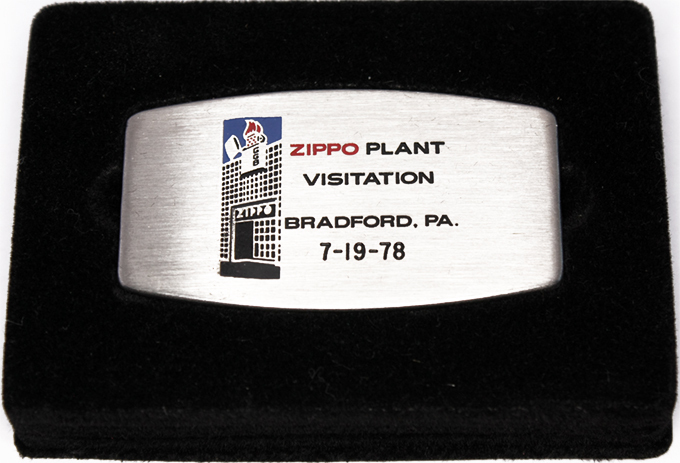 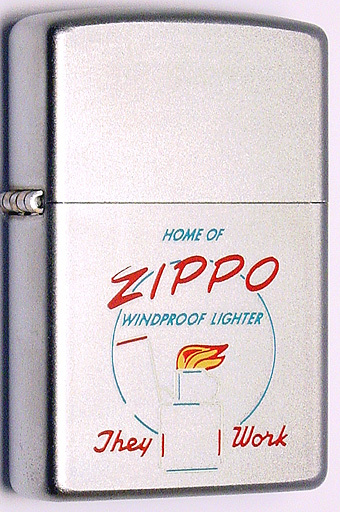 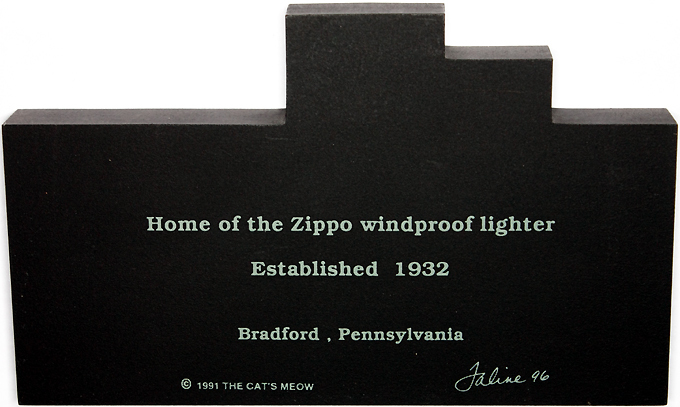 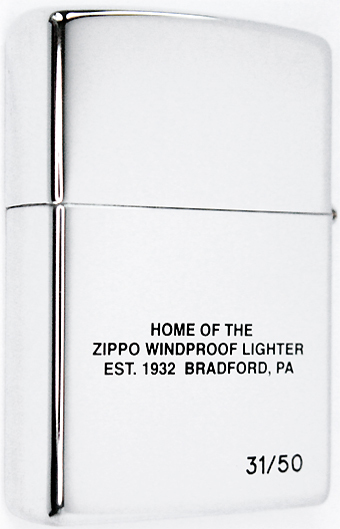 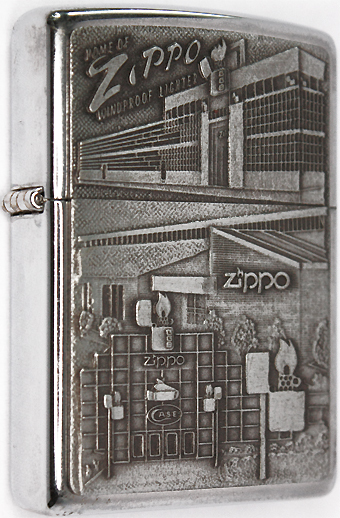 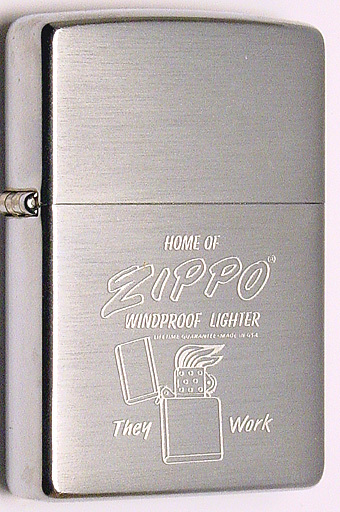 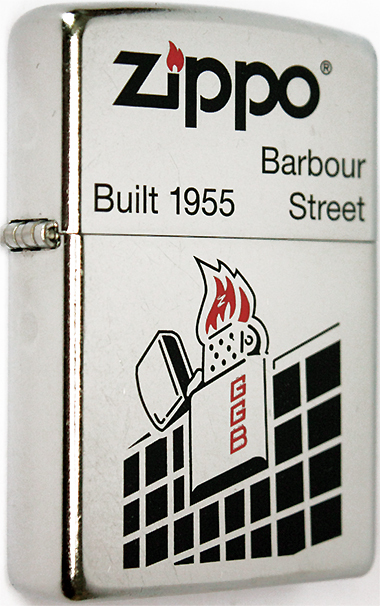 The companion lighter was only available as part of the combination set & reproduces the cover of the book, a 1950s photo of Zippo headquarters on Barbour Street in Bradford, Pennsylvania & a custom sleeve displays both pieces. 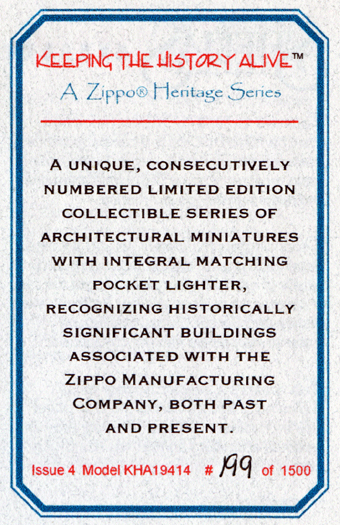 The set includes a certificate of authenticity,a two-piece lighter box & a handsome see-through display box. 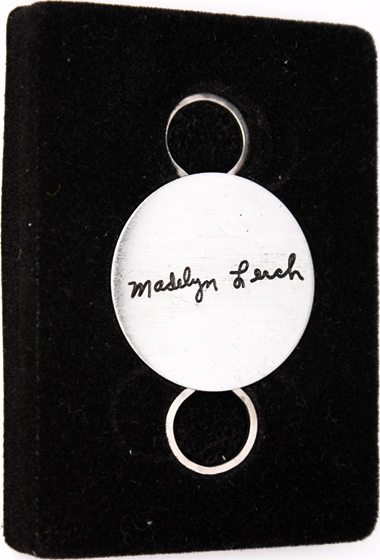 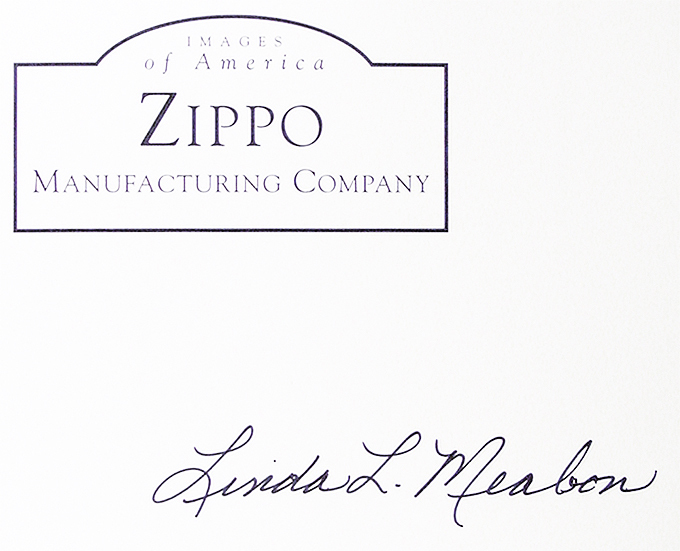 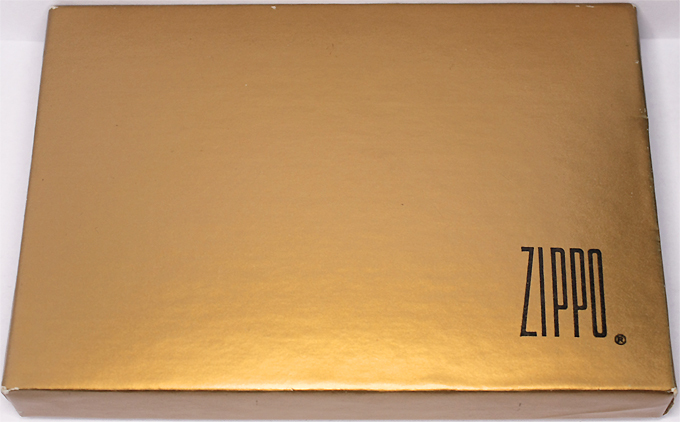 Every set that was ordered by a zippo click member is autographed by Linda Meabon! 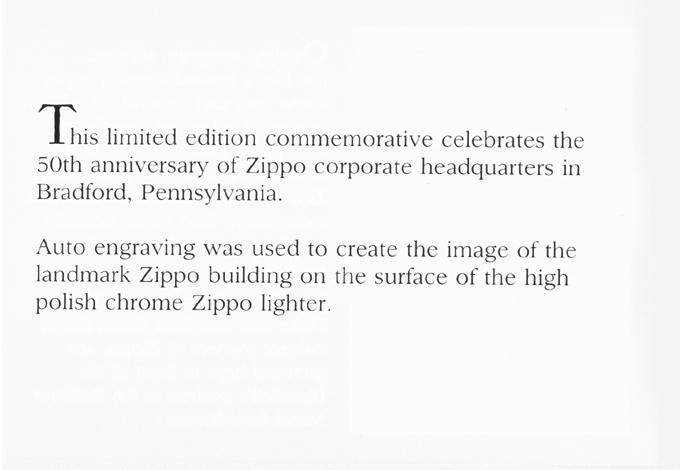 Members who placed their orders first were guaranteed to receive the very limited & autographed First Edition. 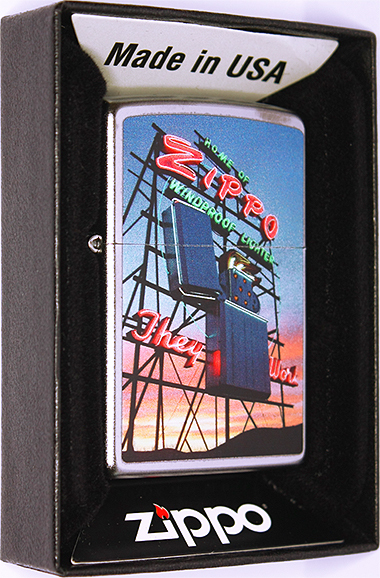 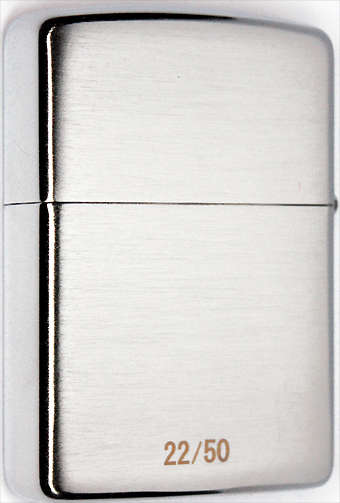 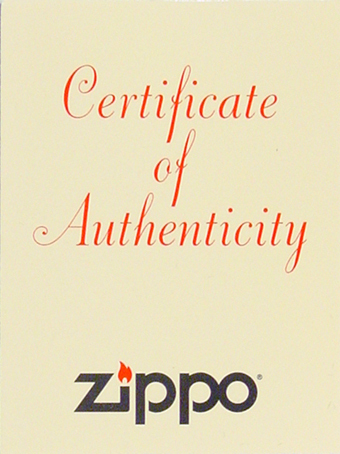 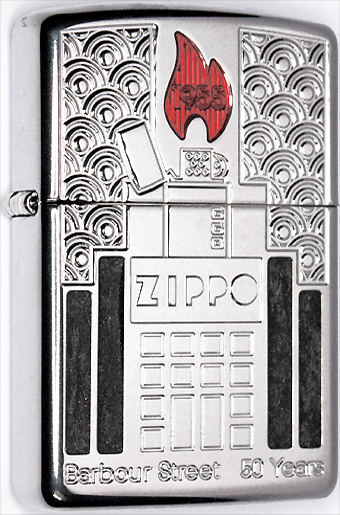 In 2006 the fourth issue of the Zippo Heritage Series was released. 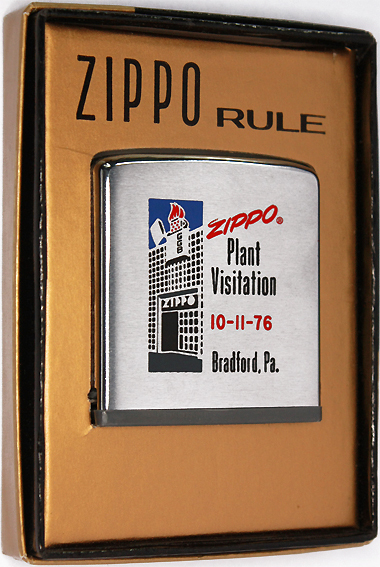 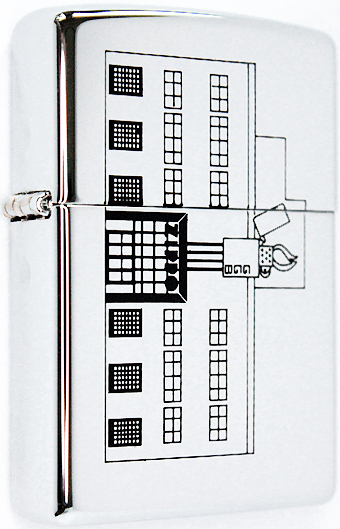 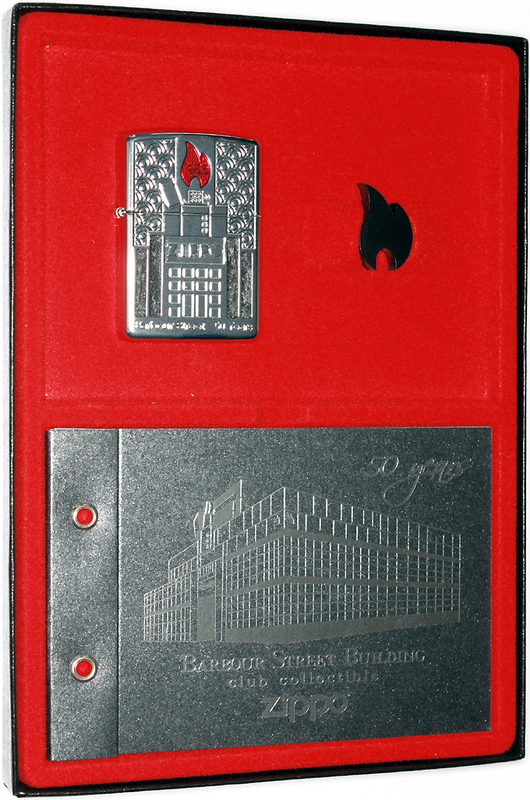 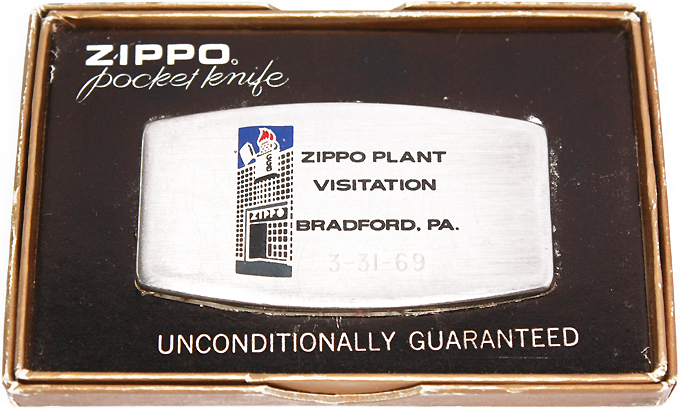 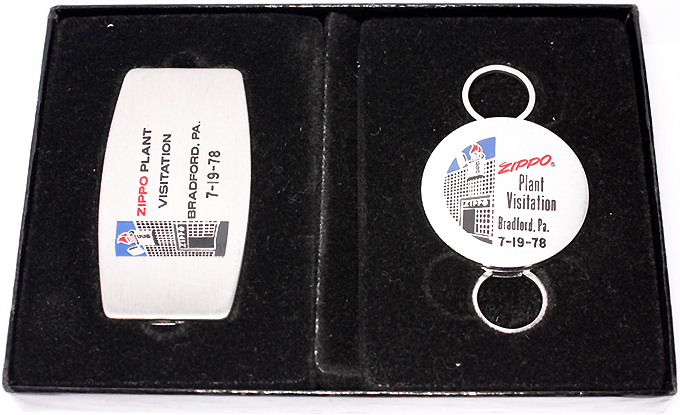 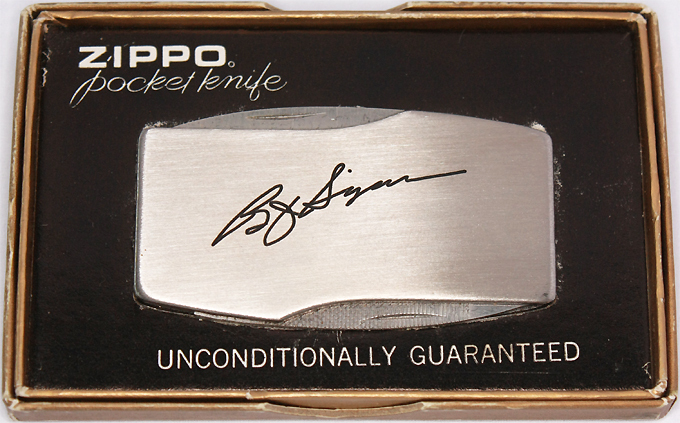 This series started in 2003 and was planned as a 10-piece collectible series, an innovative & unique production regocnizing building associated with the background, founding, history & operations of the Zippo Manufacturing Company. 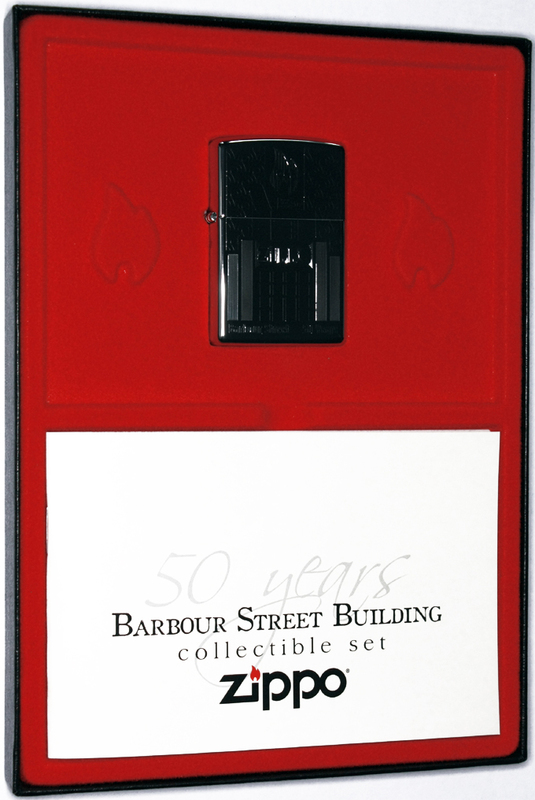 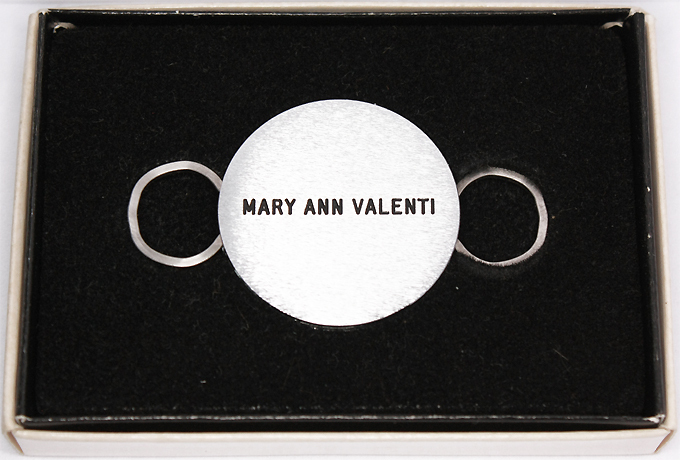 Only 1,500 consecutively numbered sets were produced for each collectible in the series. 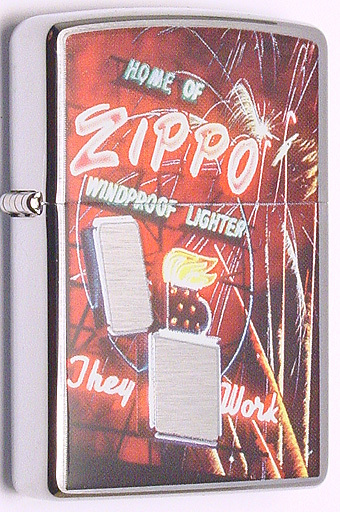 Unfortunately in 2007 after the release of fifth issue the production of this series was stopped.